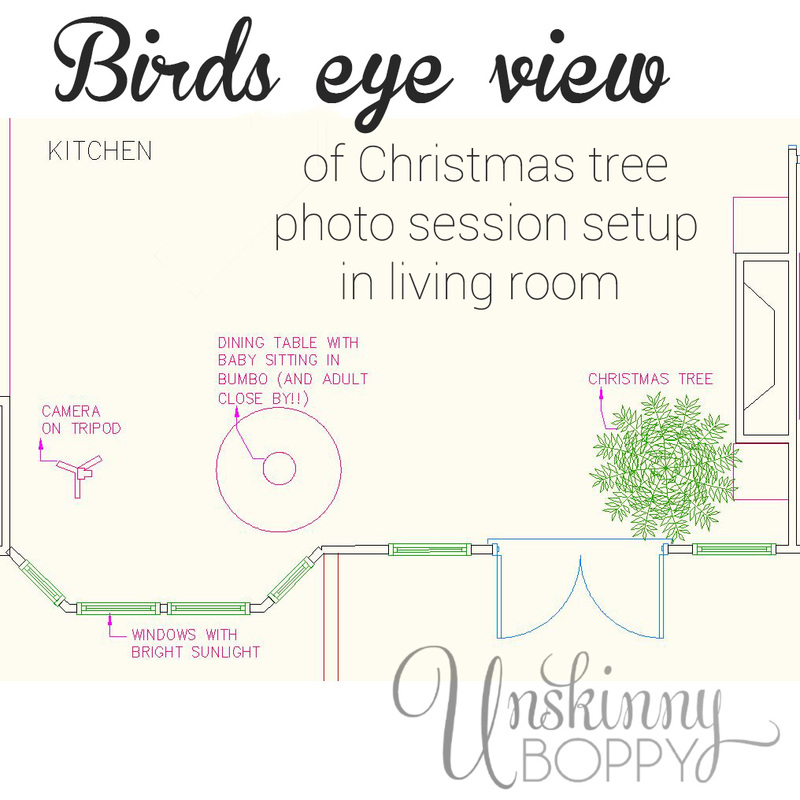 Want to learn how to photograph your Christmas tree? 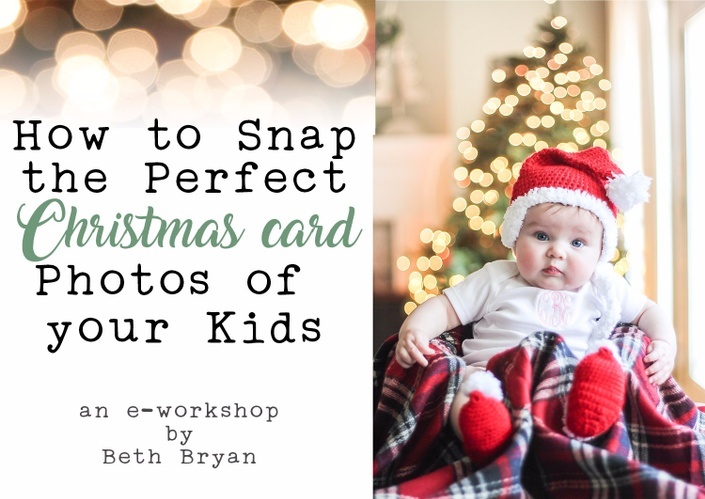 Trying to figure out how to take amazing photos of your kids in front of the Christmas lights this year? Follow this easy tutorial and capture the greatest Christmas card pics EVER! 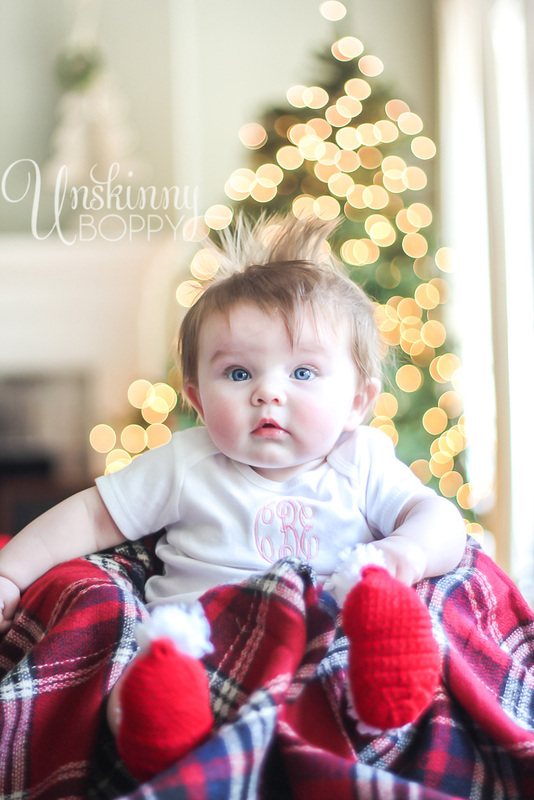 After we got the Christmas tree up this weekend we had a “Baby’s First Christmas” photo shoot with Caroline. I thought I’d share the details on how I took these pictures in case any of you are looking for instructions on how to photograph your kids in front of the Christmas lights this year. I use a Canon 60D which has really great ISO capabilities. Turn your dSLR on Manual mode and scroll around through the settings on the back of your camera and see if you can get them as close to these numbers as possible. If you have good daylight inside your house, these settings should produce a fairly decent photo. Very important: TURN OFF YOUR FLASH!! I hardly ever shoot with a flash on my camera. Always find the best light in your house so you don’t need a flash. 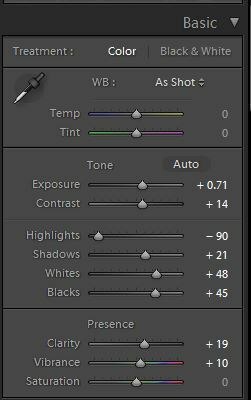 If you are shooting a shutter speed lower than 1/60 you need to be on a tripod or have a VERY steady hand or things will get blurry fast. If you are using a stock lens that came with your camera you will probably find that your aperture (or f-stop) only goes down to about 3.5-4.5. To get that amazing background blur, you’ll need to get a lens that goes allllll the way down to f-1.8 (which gives it that great blurry background called bokeh). I love this lens and highly recommend you put it on your wish list if you plan to use your dSLR camera more often. In the meantime, depending on your lighting, you’ll need to raise your ISO up to about 300 or 400 to compensate for the aperture. Here is the layout of my kitchen/ living room floorplan where this photo was taken. We sat the baby in a Bumbo seat that I covered with a pretty plaid scarf. My mom stood just outside the photo frame and made sure Caroline didn’t go anywhere while I stood behind the camera, focused on her eyeball and got the shot. If you don’t have a spotter, please don’t leave your baby sitting alone in a Bumbo seat on a table top! Not safe. 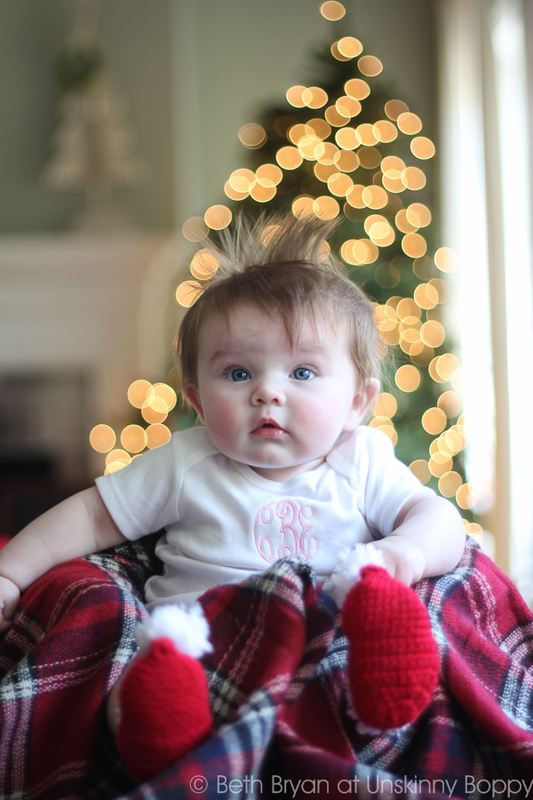 You can see that the Christmas tree is all the way across the room behind Caroline so the depth of field is pretty far. Also notice that I have Caroline facing a bunch of windows so the light is reflecting in her eyes and lighting up her face. This helps so much! 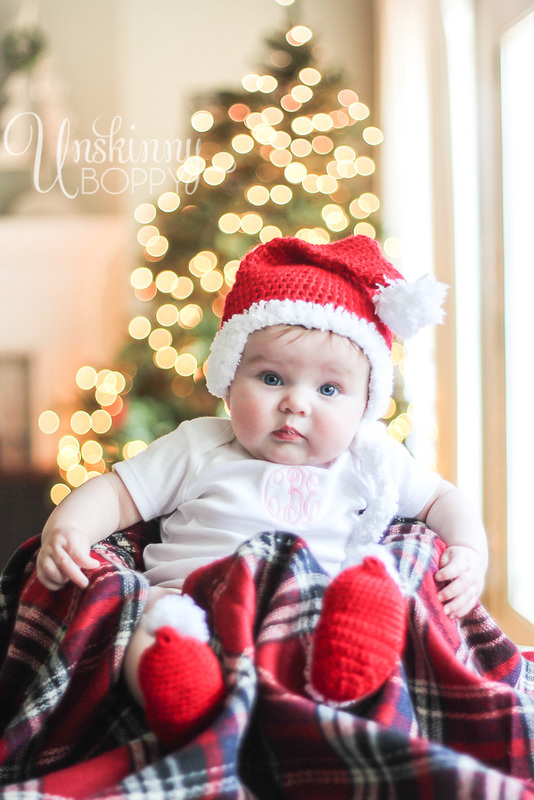 Then we added a crocheted Santa hat and some booties just to make things even more festive. And Grandma acted silly and even got a few big grins out of her! 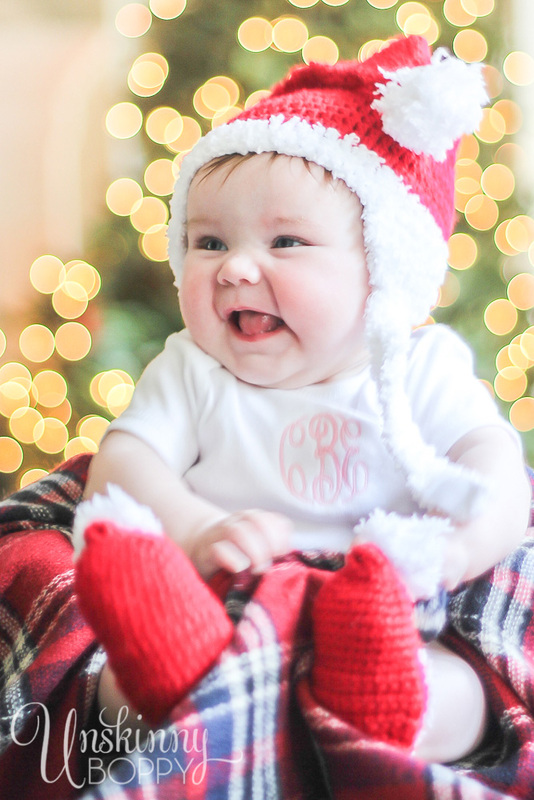 This sweet girl is ready for her first Christmas! I hope this tutorial helps you get some great shots of your kids in front of the Christmas tree this holiday season, too. 2018 CYBER MONDAY DEAL: Take 60% off your purchase through Dec 31, 2018! Like this photography tutorial? Pin it! Beautiful pictures and memories. Your little girl is just adorable. This tutorial was so very helpful! And the subject couldn’t get any cuter!!!!! Thank you for providing the lens that you love and recommend. What kind of camera do you have? Or, can you recommend a camera to me? I have a Canon 60D which has really great ISO capabilities. I absolutely love my camera and have had it for several years now. I started off with the Canon T1i as my first dSLR and upgraded to this one not long after. It does everything I could possibly need for blogging and photography. Sinkin’ cute….just so stinkin’ cute! Well, you’ve gone and done it again! I really appreciated your original at night post, and can’t wait to try out this in the next couple of days! This is a “sure to go viral” post and your little girl is so adorable!!! Gorgeous pictures! Which lens are you referring to? For some reason the link will not load for me! No way would I be able to shoot my 4 month old at 1/30 even on a tripod. He is always moving.